In The Fanshawe Scroll, Alfred and Adam decamp to the Isle of Wight to spend three weeks in relaxation. But intrigue and murder have followed them across the Channel. A strange and indecipherable manuscript, a sunken wreck full of gold, an enigmatic Russian buccaneer, a conspiracy between the members of the same club and opium smuggling provide the backdrop to this story of greed and violence. The Inspector Fenchurch Mysteries series follows the cases, exploits, lives and fortunes of crime fighting duo, Inspector Alfred Fenchurch and PC Adam Cowley; two young men from the island of Jersey who also happen to be madly in love with each other. The series is set in the 1930s. Some of the stories are classic 'whodunnit' style case files and others are more the international spy thriller. 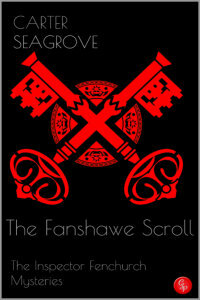 The Fanshawe Scroll is the fifth story from the series, The Inspector Fenchurch Mysteries. It follows immediately on from The Helios Protocol (the 4th), Stradler’s Game (the 3rd) and Black Veil (the 2nd). The series debut is titled The Blakely Affair. We hope that you thoroughly enjoy the story and feedback is always welcome. Please feel free to email us at carterseagrove.outlook.com and please visit the website, carterseagrove.weebly.com to find out what we’re working on next.